Presenting Companies: PlayTape, InRoad Toys’ signature product, enables kids to build instant roads, anytime, anywhere. Purpose-built as a companion product to the billions of toy vehicles sold around the world, PlayTape is capitalizing on a growing multi-billion-dollar toy vehicle market that is fundamentally lacking a simple, yet intuitive and high quality answer to the question, “where are all the roads?” We’ve created that solution, and we’re on a mission to bring it to the masses. In just two years, we’ve garnered some incredible success with retailers, reviewers, and consumers alike. [ www.inroadtoys.com ] Working Earth Solutions provides products and services that allow large businesses to use energy in ways that save money. Clients benefit through the implementation of low-cost, quick-payback energy efficiency measures at scale in portfolios of existing commercial facilities and industrial systems using turnkey, hassle-free systems. [ www.workingearthsolutions.com ] Quants Corporation ("Quants") is an investment software and consulting company specialized in the strategic alternative investments. Quants is introducing Quantsfolio.com, a subscription based SaaS platform offering complete risk analysis and portfolio solutions. 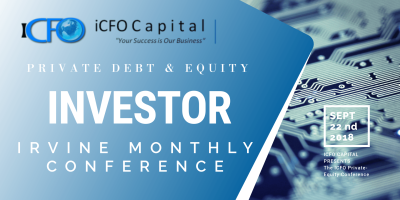 This personalized platform will be the future of online investing customized according to the needs and risk tolerance of active investors, traders and institutions. The platform has an open format which will allow the third party collaboration as well as embedding of the risk views and portfolio offerings to other institutional platforms. [ www.quantsfolio.com ] AMG Media Group, LLC (“Company”) newly formed independent Los Angeles and Shanghai based film production company founded by a highly-regarded team of business and entertainment professionals that will leverage the Company’s unique Chinese Government relationship, and broader global film-industry relationships and capabilities to make risk-mitigated investments in the co-production, co-financing and distribution of select globally-released Chinese, Hollywood and international feature films. 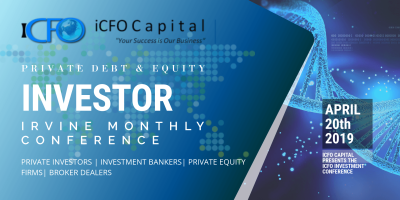 We will welcome Accredited Investors, Broker-Dealers, Private Equity Firms, Investment Bankers. 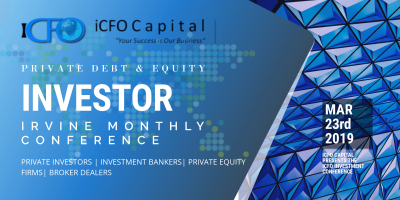 iCFO Capital is now one of the fastest growing Investment Conferences in Southern California. 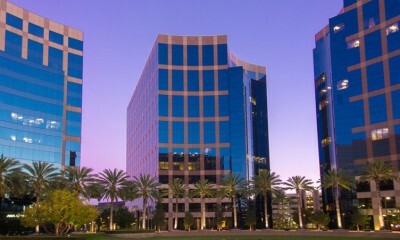 Aggressively growing our network of buyers and capital resources in a growing list of cities. 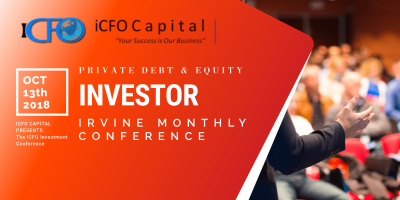 Presenting companies at iCFO events speak for approximately 15 minutes to a panel of accredited Investors and other pre-screened attendees from our network. Networking time is also scheduled to allow one-on-one conversation time during every event.